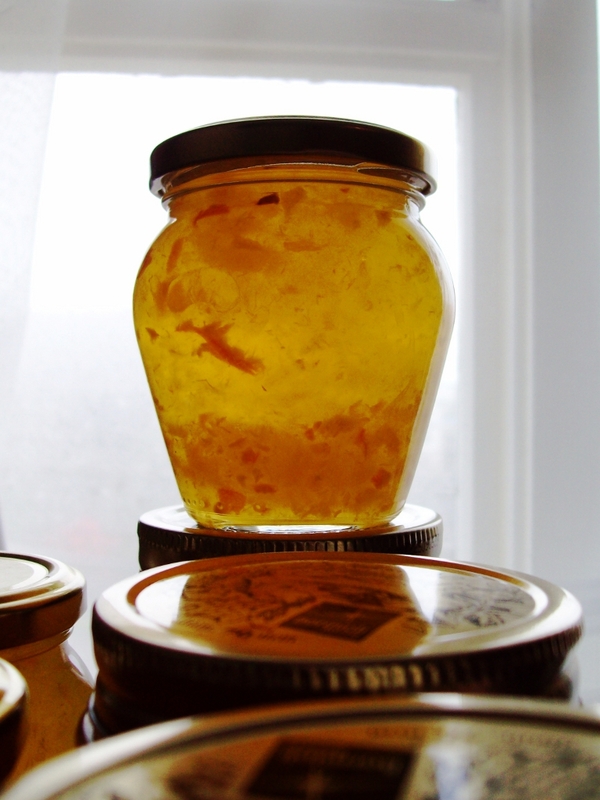 Grapefruit marmalade is a classic preserve – and look at that amazing colour! I made it to deal with a glut of grapefruit – well, three grapefruit, but that counts as a glut in our household. It felt great to be ‘putting up’ food which would have otherwise gone to waste, rather than buying produce specially to preserve. I think I’m going to be making a lot more seasonal preserves from now on. Note – this recipe yielded a huge amount of marmalade – I would recommend halving it, unless you really, really like marmalade. Wash and dry the fruit to get any nasties off the skin. Halve your grapefruit, remove any seeds, and pulse it in the blender with some of the water until it reaches your desired level of chunkiness. Tip it into the pot you’ll be using, and cover it with the rest of the water. Leave in the fridge for 12-24 hours. After waiting as patiently as you can, bring your soaked fruit to the boil. It will take a while for your large, cold pot to boil, so entertain yourself by sterilising your jars and lids. If you want to make marmalade which is shelf stable and will ‘keep’ at room temperature, you’ll need specially designed jars and lids. Ball jars, with two-part rings and lids are good, but there are lots of other brands as well. Look for lids which ‘pop down’. You can buy them in kitchenware stores, in some supermarkets, and online. Wash all your jars and lids thoroughly in hot, soapy water. Place the jars in a cold oven and turn it on to 150°. The lids go in a pot of water, and should be bought to the boil. Don’t keep the lids boiling – just keep them hot. Pop three or four saucers in the coldest part of the fridge. Boil for your grapefruit for 30 minutes to an hour – until a piece of fruit squished between thumb and forefinger disintegrates. Take the pot of the heat and add the sugar. Your marmalade will set in any time between an minute and half an hour. Put on a podcast and test every five minutes. To test for setting point, drizzle a few drops of marmalade on a cold saucer. Leave it for a few seconds, then push your finger through it. 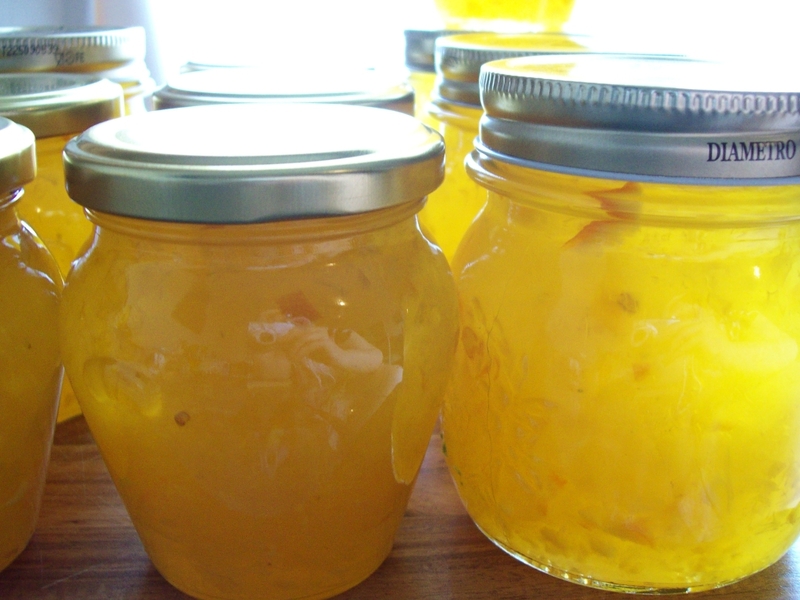 If the marmalade forms wrinkles in front of your finger, it’s done – hooray! Ladle into hot jars, and screw on the lids. Water process for ten minutes. To water process your jars, first, wash out your big pot, and line it with a tea towel. Pop some jars in the pot on top of the tea towel, folding it up, over and between the jars to stop them bashing together too much. Cover your jars with water – it should be at least an inch higher than the lids – and bring the pot to the boil. Once the water is boiling rapidly, set a timer for ten minutes. After ten minutes, pull your jars out and set them somewhere to cool down. The lids should ‘pop’ down with a little pinging sound – that’s how you know they’re sealed. 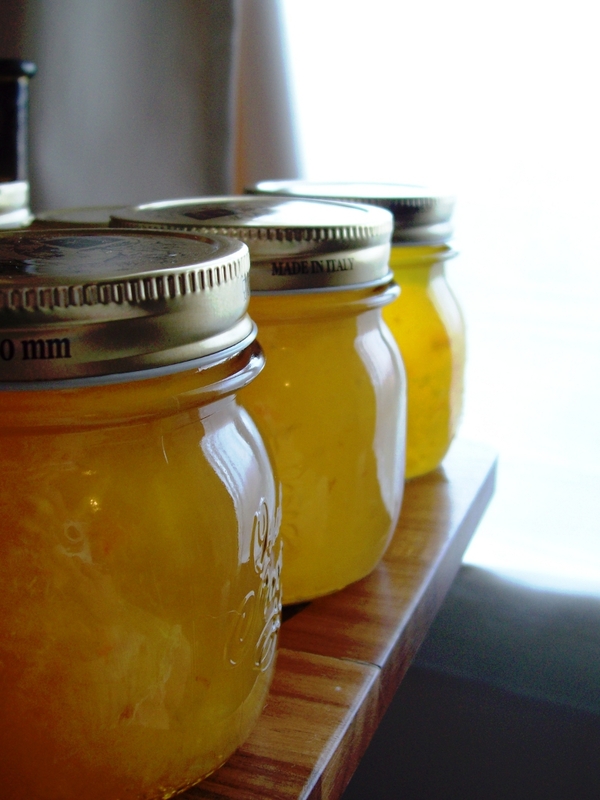 Marmalade and other preserves are the original gifts in a jar! Why not present a jar or two as a gift to a friend or neighbour? Match it up with a packet of English muffins for a beautiful, edible gift anyone will enjoy. This entry was posted in Preserves, Recipes and tagged Gifts in a Jar, Preserves, Recipes. Bookmark the permalink.